US, 1974, 107 minutes, Colour. Charlton Heston, Karen Black, George Kennedy, Helen Reddy, Efrem Zimbalist Jnr., Susan Clark, Linda Blair, Myrna Loy, Dana Andrews, Gloria Swanson, Nancy Olson, Sid Caesar. 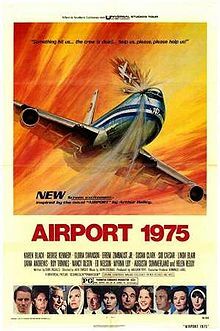 1970's Airport was enjoyable melodrama on the workings of an airport in midwinter, with bombs, stowaways and marital crises. The 1975 edition is shorter in length and in character drawing, giving us a planeful of assorted potential crises, none of which come to anything much: sick girl, anxious mother, singing nun, wise-cracking salesman, agreeable alcoholic grand matron and Gloria Swanson as herself. The film reserves all its punch for the major catastrophe: collision, hole in plane, dead crew, faltering radio, threatening mountains, Karen Black at controls, Charlton Heston to the rescue. It is only an average film. 1. How satisfying was this film as entertainment? Critics said it was computerised entertainment; all the ingredients for successful audience reaction included. Do you agree? 2. What estimation of the quality of audience response did the producers have? Did they overestimate or underestimate their audience? How well did they entertain their audience? 3. What appeals to audiences for disaster films? The danger, the threat of death, the spectacle? Why do audiences enjoy films involving a miscellaneous group of people, running the risk of danger and death? How successful was the film on this level? 4. While the film might have been computerised, were the characters, situations, dialogue etc. on the level of cliche or did they rise above this? In such a film do conventional characterisations etc. matter so much? Why? 5. How plausible was the plot? How reassuring in its saving the plane and the peoples' lives? How plausible the picture of Freeman in the small plane and his heart attack? The presentation of airport techniques in helping planes? The importance of technological aid? The safety features in planes e.g. autopilot? Would audiences still feel safe in planes after seeing this film? 6. How attractive a person was Nancy? Our first response to her and her emotional problems? Her capacity for doing her job? Nancy's relationship with the other hostesses, her treatment of the passengers? The impact of fear in the disaster? Her ability to cope with the situation and the directions? Audience identification with her during the saving of the plane? Feelings of exhilaration at her success? How did this situation change the relationship with Allen? 7. How interesting a hero was Allen? Conventional? Was it inevitable that he would be able to help with the damaged plane? His selfish attitudes and the change of his relationship with Nancy? 8. Comment on the picture of the crew. The pilot and the co-pilot and the jokes and banter? The hostesses and their chatter to each other, apprehensions about the flight? The death of the co-pilot? The hostesses' fear and their coping? The injuries sustained by Stacy, his not wanting to be drugged, his helping to save the plane by his advice? 9. How interesting a character was Joe Petroni? His anxiety because of his wife and child? His capacities for organising the rescue? 10. What was your reaction to the TV Commentator and his intrusion into the affair? Why? 11. How well developed were the personalities and stories of the characters? Mrs. Petroni and her son and their tour of Washington, the girl with the kidney illness, her anxious mother, (was sufficient made of the suspense? ), her guitar, the singing nun, the elder nun, the elderly drinker, the comedian, the drunks? How enjoyable was this group of passengers? 12. The importance of having Gloria Swanson as herself? What effect did this have for the reality of the film? Peoples' treatment of her? As a celebrity, talking about herself and her memoirs? Her response to the disaster? 13. How well handled was the danger situation? The detailed directions for Nancy to manoeuvre the plane? The deaths and the suspense? The helicopter arrangements? The suddenness of the death of the first pilot? The inability to break for a landing? 14. How valuable are films like this as escapist entertainment? Why do they appeal so much to ordinary audiences? Dangers and the need for survival?